I just added over a 250 pictures to Shutterfly. For some reason the slide show stopped working. I will try to fix the problem – for now visit this link to view pictures of Jordan. Yesterday I did a day trip around the Jordan valley, I hooked up with a French girl who is in school in Amman, her ancestry is from Algeria, we split the cost for the car. The Jordan Valley is a remarkable area with high assent up to the Jordan plane and on the other side of the Jordan River, the high assent to Jerusalem. 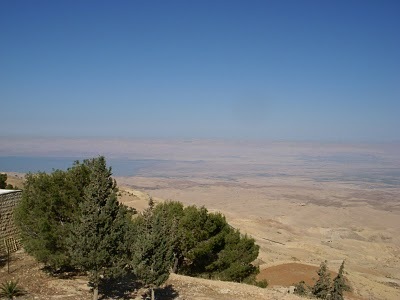 We went to visit Mount Nebo first where Moses looked on to the land of the Canaanites. 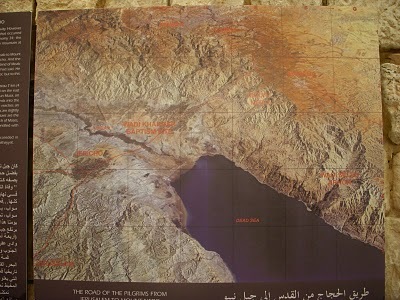 The below picture shows the Dead Sea to your left. In the far distance to your right is Jericho, we were able to see a glimpse of Jerusalem, although in this picture it may be difficult to notice, it was somewhat hazy. From Mount Nebo to went down into the Jordan Valley to the tourist site of Bethany – beyond the Jordan, the site that Jesus was Baptized. 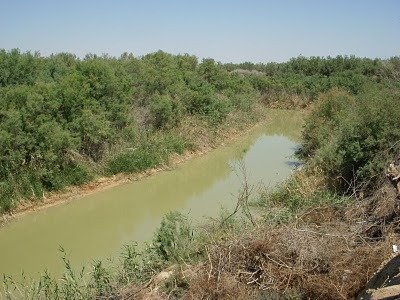 This area is most likely the area that John preached and baptized people in the Jordan river. 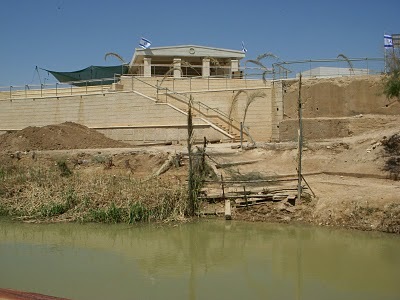 Even if this is not the area, it was a good place to visit, because we went to the Jordan River with Israel/Palestine on the other side as you can see in the below pictures. 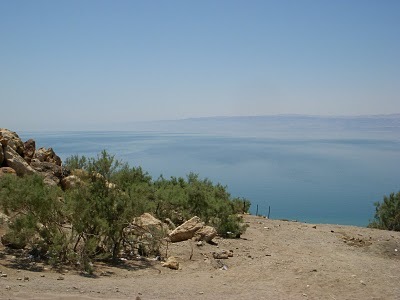 From Bethany we went to the Dead Sea, certainly a spectacular place of one large dead salty sea. With the rugged desert hills in the background, the landscape is of natural beauty. 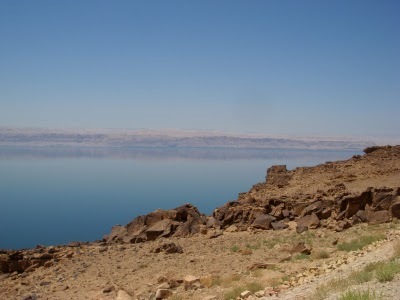 The lowest point on the earth is the Dead Sea, a place you will just float like a cork. The Jordan River Valley is truly a beautiful area. The Weather is very diverse here in Jordan. Aqaba and Wadi Musa was very hot. Dana was very cold and night and pleasant during the day. Karak was also cool at night. Madaba is also nice and pleasant with cool evenings. The Jordan Valley was very hot being so low in the earth. Driving from the valley to the upper plane was one heck of a drive. 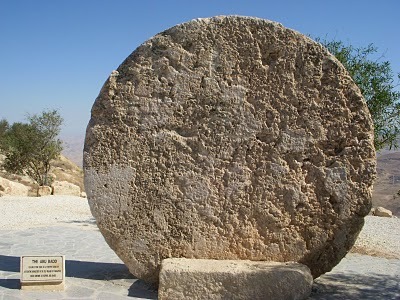 Due to the fact that the Jordan plane is high, cool weather is pleasant in the spring and autumn and cold in the winter. Indeed, during the time of the Israelites and Moabites, if one nation wanted to attack the other they had to climb up hill to get to the capital, no easy task. The hotel I am staying at is very nice. Two older people own the hotel, it started out for a place to house people that were in the Peace Core. We have breakfast in the kitchen of the home, kind of feels like your at grandma’s house, anyway, the lady of the house offered to cook me dinner tonight, she said just for me and not for any tourists. What a nice offer, it is always enjoyable to have a home cooked meal. When I arrived the extended family was at the house/hotel (the house is on the second floor) they invited me for a bite to eat – excellent food – they are a Christian family. Giving of one’s time is the trick, If I arrive first for breakfast, most times I am the last person at the table – most people eat fast and head out. I can understand if people are on a two week holiday, although not being selfish over one’s time is a hidden secret to satisfaction. Now there are some things that a person could complain about like the lack of hot water, it must be a Jordan thing. Also the prayer call at 4am is another subject, I don’t mind five minute prayer calls in the morning, but this guy was reading the Qu’ran until 5am – I mean really whats the point, everyone is sleeping – what did they do before electricity existed? I have been thinking to get up and go to the Mosque and see how many people really show up at 4:30 in the morning. Moses taught don’t complain, I have gotten use to it – not a big deal anymore – early morning prayer calls and all. Some places in Egypt I did dream of climbing and cutting the wires to the loud speakers. 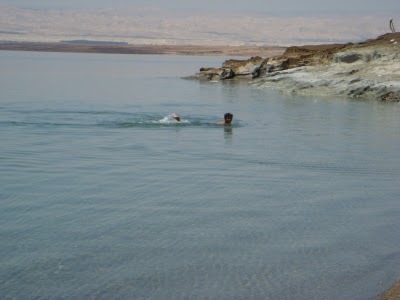 A person swimming in the Dead Sea. Next post: Heading to Amman. Previous post: The Mosaics of Madaba.